The Seine River is the second longest river flowing completely in France with a length of 483 miles. This river also serves as an important commercial waterway. The source of this river is a village named Source-Seine. This remote spot is located at a height of 1,545 feet above sea level. The river flows north-westerly through Paris. It is connected to the River Rhine by the River Marne. 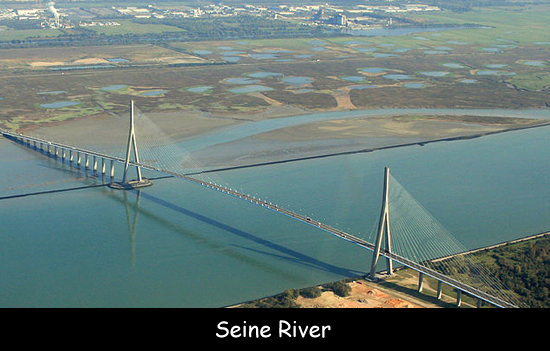 The mouth of the river is the Seine Estuary located between Le Havre and Honfleur at the English Channel. The drainage basin of the Seine River covers a total area of about 30,000 square miles. Almost two percent of the basin area is forest and seventy eight percent is cultivated land. The average depth of the river is approximately 31 feet and its width varies from 30 meters to 200 meters. This river has been declared as a World Heritage Site by UNESCO in 1991. The name Seine has been derived from the Latin word sequana which is believed to be related to a Gaelic name. Approximately half of the water used in Paris is supplied by this river. The Seine River has a relatively low average water flow, just a few cubic meters per second. This low average water flow makes it easier to navigate. There are a total of thirty seven bridges spanning the river within Paris. The Pont Neuf is the oldest standing bridge of them all. This river is also used by several power stations in the area as the source of their cooling water. Declan, Tobin. " Amazing Seine River Facts for Kids ." Easy Science for Kids, Apr 2019. Web. 26 Apr 2019. < https://easyscienceforkids.com/seine-river/ >.